Pursuant to federal requirements, CDOT develops a four-year Statewide Transportation Improvement Program (STIP) and a long-range (minimum 20-year time horizon) Statewide Transportation Plan (SWP). While extensive investment needs are identified through the transportation planning process, the STIP captures only those project needs that can be funded with expected revenues over the next four years. The SWP integrates Colorado's 15 long-range regional transportation plans (RTPs) and provides a longer-term view. The RTPs identify each regions' long-range investment priorities at varying levels of detail. For example, while some identify specific regionally significant projects, others prioritize corridors and identify only general types of improvements needed. The purpose of the development program is to bridge the gap between the four-year STIP and the 20+ year SWP, by capturing the major investment needs and priorities identified in the planning processes over a longer timeframe. The development program is a part of the transportation-planning process focused on identifying major investment needs and establishing priorities with planning partners to support the long-term development of the state transportation system. It includes two key components: the Development Program Inventory of Major Investment Needs; and the 10-Year Development Program Plan. The Development Program Inventory of Major Investment Needs is developed first, through a statewide inventory of needs documented in planning and development studies, including regional transportation Pplans (RTPs) and through additional input from CDOT staff and planning partners. The Inventory of Major Investment Needs is developed first, through a statewide inventory of needs documented in planning and development studies, including regional transportation plans (RTPs), and through additional input from CDOT staff and planning partners. The inventory is not intended to capture every potential project identified to date; it's intended to capture transportation projects defined as “major" by each CDOT region, and major investment needs for transit, bicycle/pedestrian, and operations. Typically, these major investment needs are projects that are unlikely to be funded to completion through traditional funding sources, and will require some other funding sources, such as a new revenue source or discretionary grant funding to make significant progress toward completion. The focus on major investment needs means that a large number of smaller projects are not included. While some of these smaller projects can be funded through existing funding sources, many others cannot. As such, this inventory is only a partial picture of significant unmet transportation needs. Additionally, the inventory only includes projects that would be funded with revenues flowing through CDOT, if sufficient revenue were available. It does not include projects that are anticipated to be funded primarily with local, regional (i.e. MPO or transit agency-directed) or private funding. 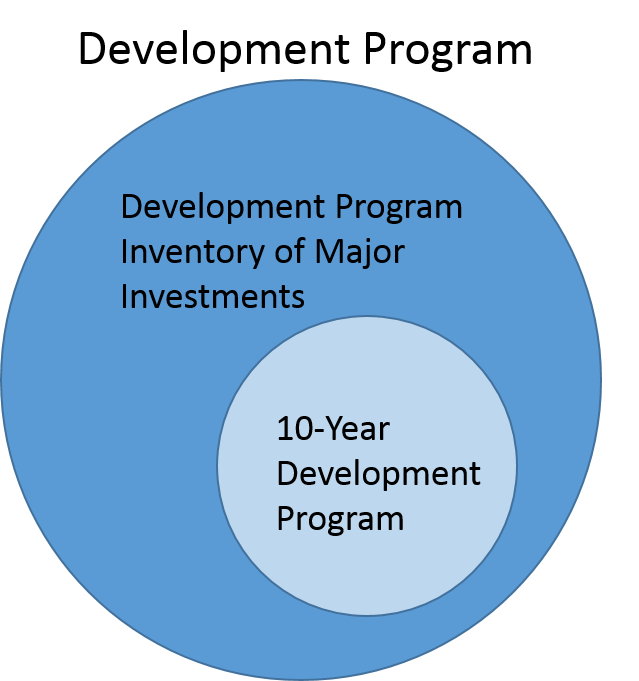 The 10-Year Development Program Plan is a smaller subset of the Development Program Inventory of Major Investment Needs, identifying those major investment needs that are a higher priority over the next 10 years. What types of transportation investment does the Development Program feature? The Highway Capacity Development Program represents projects that would increase highway capacity and expand the highway system. CDOT currently allocates less than ten percent of its annual budget to capacity expansion projects. This is relatively little funding given statewide needs as represented here in the Development Program. The era of large-scale expansion of highways and addition of new travel lanes funded by the gas tax has passed. CDOT does not have enough funding to keep up with maintenance needs over the long run and cannot afford to continue adding to those needs without additional funding to support them. The Division of Transit and Rail (DTR) is in the process of assessing three separate components of transit needs in Colorado, including operational needs, asset management needs, and capital expansion needs. The Transit Development Program (TDP) identifies capital projects only, including Facilities, Infrastructure, Equipment, Service Expansions or Capital Planning projects. It does not include asset management needs such as vehicle replacements, nor does it identify all operational needs. It does capture the operational needs associated with those capital projects in the TDP, however. Initial information included in the TDP was based primarily on the Statewide Transit Plan, Regional Transit Plans, Local Plans and any current transit studies. A separate Intercity Rail Development Program is also being developed by DTR to identify capital rail projects for intercity needs. This would include such projects as the Advanced Guideway Systems (AGS) along the I-70 corridor, the Intercity Commuter System (ICS) along the Front Range, or the Southwest Chief passenger rail projects identified in Southern Colorado. It does not include local and regional transit rail projects such as the Denver Area’s FasTracks projects, which are included in the TDP. CDOT is currently conducting a statewide inventory of bicycle and pedestrian assets on or adjacent to the state highway system, making additional investments in the non-motorized counting program to improve data on the use of these assets. Additionally, an effort is underway to identify high demand bicycle corridors on the state highway system. These efforts will provide the foundation for the identification of major bicycle and pedestrian investment needs to be incorporated into the Development Program. This section of the Development Program also includes Americans with Disabilities Act (ADA) Curb Ramp projects. Mobility Operations projects in the Development Program represent projects that would improve travel time reliability and safety on Colorado highways through technology, innovative programs, traffic management activities, and safety improvements to maximize the return on investment of transportation funds. CDOT maintains more than 9,100 miles of highways and about 3,400 bridges statewide. Due to increased demand and diminishing funding, it is a challenge to keep pace with the system preservation and maintenance needs of the transportation system. CDOT has a Risk-Based Asset Management Plan (RB AMP) to chronicle CDOT’s history of asset management and define a framework for implementing new asset management strategies. The Development Program contains the critical asset management needs that are currently unfunded. What is the current status of the Development Program? Updated scope, schedule, and cost information. Removal of projects that have since been completed or for which funding has since been identified. Addition of projects and priorities for all modes and identification of integration opportunities across all modes. How does this relate to other project selection efforts? The Development Program is a tool to track needs and support planning and project selection processes, including the development of the federally required four-year program of projects, the Statewide Transportation Improvement Program (STIP), and the identification of priorities for different funding opportunities, including Senate Bill 09-228, Senate Bill 16-267, the new National Highway Freight Program (formula freight program), discretionary grant programs, innovative financing, and new/additional revenue. When/how will the Development Program be updated? The Development Program Inventory is a "living" document and can be updated as needed to align with public involvement efforts and the annual STIP update process. A major update is anticipated to occur in conjunction with the 2045 Statewide Plan Development. Does a project need to be included in the Development Program to be included in the STIP? No. Most projects included in the STIP are smaller in nature, and not likely to be identified in the development program (for example, a surface treatment project). Major investments needs will most likely be in the Development Program before being added to the STIP once funding is identified. Once a project is moved to the STIP, it is removed from the Development Program.